John Salt (born 1937) is an important Photorealist, originally from England, whose work demonstrates an awareness and compassion toward abandoned and decaying landscapes often depicting cars, homes, and urban and rural scenery. His work has been exhibited at significant international art galleries since the 1960s. John Salt was born in Birmingham, England in 1937. As a child, he spent time in his father’s motor-repair shop. His father’s stepfather also painted cars. So, from an early age, both cars and art were important in Salt’s life—he has been drawing as long as he can remember. At age thirteen, Salt visited the Festival of Britain, organized by his school art teacher Donald Knight. There, he got a glimpse at work by many of England’s major contemporary artists. The festival, as well as the industrial art of Prunella Cough, shaped Salt’s growing interest in machine and technology-inspired work. By age fifteen, Salt had applied to the Birmingham College of Art at the encouragement of Knight. He was accepted. At Birmingham, working under more conservative teachers, Salt mastered the fine-tuned academic styles of painting and drawing. This technical education no doubt influenced the highly detailed ‘Exactitude’ style for which Salt would later come to be known. Salt completed his degree in 1957. A year later, he moved on to post-graduate studies at the Slade School of Fine art in London. At Slade, Salt’s teachers were slightly more progressive, but it was London itself that really opened Salt’s eyes to 1960s avant-gardism. For the first time, he saw the work of British Pop artists like Richard Hamilton and David Hockney, as well the work of American contemporaries Jim Dine, James Rosenquist and Robert Rauschenberg. Salt was particularly drawn to the American artists’ work, and by 1967 he was determined to go to America. He secured a spot at the Maryland Institute College of Art, Baltimore, and his dreams became a reality. Salt’s studies in Baltimore proved crucial to the development of his car-culture-inspired artwork as they brought him close to Washington, D.C., where he saw Ed Kienholz’s automobile sculptures and post-war photography by Garry Winogrand, Bruce Davidson and others. Salt’s work started to evolve. He began to paint from photographs of cars—first, as they appeared when they were gleamingly brand-new, then, in various states of decay. Realist painter Alex Katz, who assessed Salt’s portfolio at the Institute, particularly liked one of Salt’s paintings inspired by a Buick brochure. Katz’s praise confirmed Salt’s interest in cars and car-culture art, and in 1970 Salt moved to New York, where his paintings of cars would establish him as a major member of the Photorealist movement over the next two decades. In New York, Salt focused entirely on automobiles. He traveled around upstate New York finding parked and neglected cars and photographing them. Salt devised an exacting technique, first choosing his photographs, then making elaborate drawings from the photos, dividing the images into light and dark as well as by tone and hue. Based on the shapes in the drawings, Salt would make hundreds of precise stencils for every image, which he assembled into the matrices over which he would paint. His subject matter became as precise as his style: closeups of crumpled cars, left to fall apart off the road. This type of image became a medium in itself, one that Salt explored for decades. 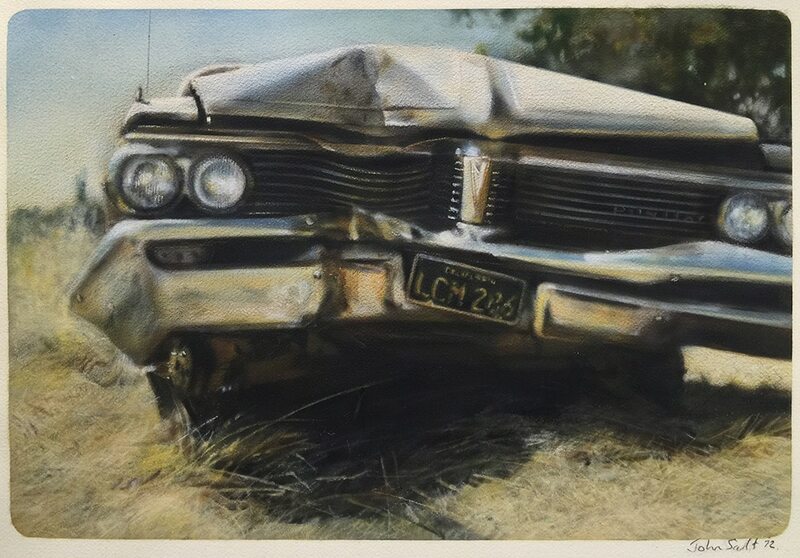 His paintings of the detritus of American car-culture seem to be both compassionate portraits and ardent social critiques—of course Salt “denies any message” and insists there is “no lecture intended” in his art, cultural, ecological, or otherwise. Either way, Salt’s iconic paintings separate him from the glossier work of some of his contemporaries. He utilizes photorealism to a gritty yet nostalgic effect unparalleled in the Photorealist movement. In the early 1990s, Salt moved back to his native England, where he stepped back from his car-subjects—and started painting from wider shots of them, still using photographs he took in America. His oeuvre is powerfully concise: he has achieved notoriety with under two hundred canvases and watercolors, most painted during two decades in America. He has exhibited at a number of important institutions, with solo exhibitions from 1970 onwards. His work is included in public collections at the Wolverhampton City Art Gallery and the Birmingham Museums and Art Gallery in the United Kingdom. He currently lives and paints in Shropshire. 1997 – “White Chevy Red Trailer: John Salt Paintings, Prints and Other Works From 1953-1997,” Wolverhampton Museums of Art Galleries, Wolverhampton; Silk Top Hat Gallery, Ludlow, England.